Original costume sketch for Heather Young as a Spindrift flight attendant for Land of the Giants. 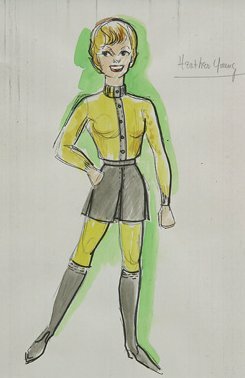 (ABC-TV, 1968-70) Costume design sketch featuring Spindrift flight attendant "Betty Hamilton" (actor Heather Young) in a yellow & gray uniform with high boots from Land of The Giants. A Irwin Allen series about an alternate earth inhabited by giants. While some black lines are photocopied, the costume designer hand-inked in other black lines and hand-applied colors to the drawing as the costume was realized during the conceptual process. Measures 15 in. x 26 in.